Pics and Kicks: Officially Amazed. These actually work and they are absolutely amazing. I think I can safely say that they have actually revolutionized my life in a very real way. 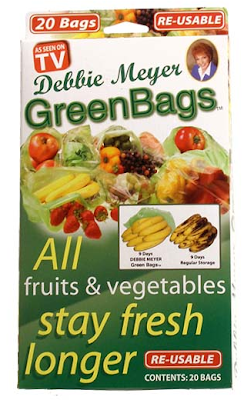 Debbie Meyer Green Bags for life! its about time you got them...now you don't have to throw away so much veggies. So glad to know that! I was wondering if they did what they claim! That's good to know! My husband and I were just commenting over our too soon to be black bananas on the counter this morning!! These things really ARE exactly what they say they are. I LOVE mine. I was shocked at how well they actually work. Oh my gosh! My dream bags you tried them. I knew they would work! I just knew it. Thank you for experimenting for me. Seriously Bitsy! Buy them. Don't hesitate! You will be so happy with them. I'm not kidding when I say that they changed my life!